Wheat Blast or Magnaporthe oryzae, pathotype Triticum (synonym Pyricularia oryzae) is a potentially devastating fungal disease that reduces yields by shriveling grain or by leaving spikes completely empty. Better known as a pathogen of rice, where it attacks the leaves, the fungus strikes also the heads of wheat, which are difficult for fungicides to reach. 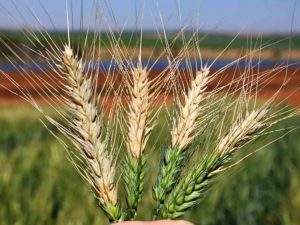 First sighted in Brazil in 1985, the disease is widespread in South American wheat fields, affecting as many as 3 million hectares in the early 1990s and seriously limiting the potential for wheat cropping on the region’s vast savannas. Blast was reported in Bangladesh during the winter cropping season of 2015-16, shortly after crop flowering. This marks the first time it has been observed in South Asia. The disease appears to have spread because of high base temperatures with sudden rain events and associated wind patterns that favored spore distribution. Over the past season, it has reportedly affected more than 15,000 hectares – roughly 16 percent of the country’s wheat area – resulting in a yield reduction of approximately 30 percent in the country’s Feed the Future (FtF) zone. Thirty years of research in Latin America has resulted in some wheat cultivars that are tolerant to blast, but little tolerance has been observed in currently-grown South Asian wheat varieties. With the emergence of wheat blast in Bangladesh, and adjacent areas in India and Nepal similarly experiencing relatively warm and wet winters, wheat researchers must identify sources of resistance and develop resistant varieties, elucidate the epidemiology of the disease and find optimal control practices. The CIMMYT-led Cereal Systems Initiative for South Asia (CSISA) has been quick to respond to the threat in Bangladesh, assisting government partners to first identify blast in farmers’ fields and conducting risk assessment exercises with NARES partners to more accurately gauge the nature and extent of the threat. Working with the Wheat Research Center (WRC) of the Bangladesh Agricultural Research Institute, diseased wheat plants were collected at the early onset of the disease. Samples sent to the Foreign Disease-Weed Science Research Unit laboratory in the US for characterization confirmed Magnaporthe oryzae by molecular analysis. Outbreaks of diseases are a function of having a susceptible host (in this case wheat), the pathogen and a conducive climatic environment. “Wheat blast is not a new disease. This means we can use past experience and knowledge from Latin America to prevent further damage in Bangladesh and the region,” says Arun K. Joshi, CIMMYT India Country Representative. In collaboration with the Bangladesh University of Engineering Technology, CSISA is using applied research to investigate the potential threat for the spread of blast given available climatic data from the Bangladesh Meteorological Service. Initial efforts have resulted in an index that can be used to predict the risk of blast outbreak for areas where wheat is grown. CSISA is now further strengthening this analysis using gridded data from global atmospheric circulation models and historical weather data to create a robust decision support tool to assess the risk for continued blast infection. Spatially explicit crop cuts in farmers’ fields to better understand farmers’ management practices and monitor the status of seed infection. Trials examining genotype by environment by management effects on yield and blast infection with advanced lines expected to provide the best control against blast. Trials validating the performance of seed treatments and fungicides. Surveys of non-crop refugium (non-crop host grasses) outside of farmers’ fields to assess options for management of non-rabi season blast refugia. In collaboration with the Bangladesh Agricultural Research Council, Bangladesh Agricultural Research Institute and Wheat Research Center, CIMMYT organized a two-day regional consultation workshop mitigating the threat of wheat blast in Bangladesh and beyond. The consultation brought together leading research scientists from South Asia, Latin America, Europe and the US to discuss findings of the Bangladesh Emergency Task Force and develop a shared roadmap to best address the threat. It was supported by the Australian Centre for International Agricultural Research and the U.S. Agency for International Development and was held in Kathmandu, Nepal. This article is authored by Ashwamegh Banerjee, Assistant Communications Specialist, CSISA.